RingSafe is the simplest product that could just save your marriage. Whether you've just misplaced or truly lost your wedding band - the ring can be replaced, but the sentiment and meaning that go with it are irreplaceable. RingSafe is the elegant & simple solution for ring-wearers who periodically need to remove their ring for work or play. This modern accessory quickly secures your ring to a chain or key-ring, keeping your ring close to your heart but safe from wear & tear. 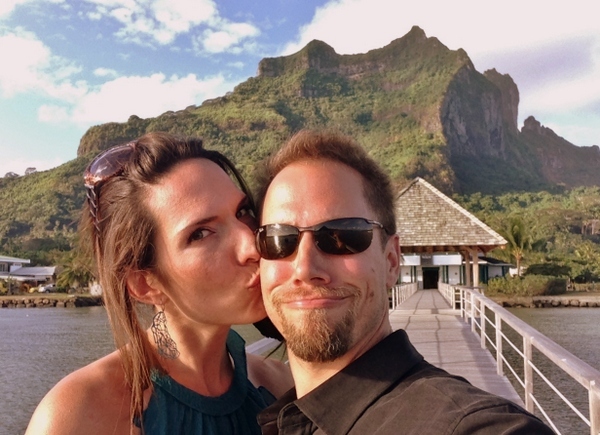 The RingSafe team are John & Kirsten Newbold-Knipp, a small business owner and a marketer who found themselves in need of a solution just days after their 2013 honeymoon. RingSafe - like many new products - was invented of necessity. John owns Newbold Stone - a high end concrete design firm - and he can't safely wear his ring at work. Three days after the honeymoon, John's wedding band was not in his pocket when he got home. Luckily, he found it the next day but that was not the best conversation to have just a few weeks after a wedding. Fortunately, he has an engineering degree and a 3D printer, and within a few days the first plastic prototype was secured around his neck. It occured to Kirsten that John might not be the only forgetful hubby in the world. As it turns out...there are a lot of men and women who take their rings off for work or sport - and most of them have no good way to keep their rings safe. The duo embarked on a journey of invention and with the help of community support from Kickstarter, where RingSafe was successfully 115% funded, they launched RingSafe. RingSafe is now made in stainless steel - so John and millions of others can use it at work, at the gym, during water sports, rock climbing, making art, fixing up the house, even doing dishes or handling meat.